2003 In Siirt, Turkey, Recep Tayyip Erdogan, 49 [photo >], leader of the AKP (Justice and Development Party) and 2 of his followers win the 3 parliament seats at stake, by a 84.7% majority. The AKP won overwhelmingly in the 03 November general election, from which Erdogan was barred for having incited religious hatred in Siirt. The AKP thereupon changed the constitution to make Erdogan eligible. A few days later in March 2003, interim prime minister Abdullah Gul resigns, and Erdogan forms a new government. 2002 Rigged presidential election in Zimbabwe. First day of presidential elections in Zimbabwe, in which which President Robert Mugabe, head of the ZANU-PF party, tries to add to his already 22 years in power, after a campaign of which the US State Department said the previous day: The government of Zimbabwe continues its blatant campaign of violence, intimidation and manipulation of the electoral process in an effort to win the poll..It is clear that the government intends to win the election by any means. And so it does. The two-day election is extended to a third day, 11 March, by an order of the High Court, on an appeal of presidential challenger Morgan Tsvangirai of the Movement for Democratic Change. citing Mugabe's deliberate reduction of the number of polling station in the MDF strongholds, so that some voters were frustrated after waiting in line for up to 20 hours. But Mugabe's government obeys the order only in Harare and there opens the polls 5 hours late. However the High Court rejects the opposition's request to extend the voting into a 4th day. On 13 March 2002, it would be announced that Mugabe won with 1'685'212 votes to 1'258'401 for the challenger, Morgan Tsvangirai of the Movement for Democratic Change. Predictably, Tsvangarai calls the election illegitimate, but so do practically all the foreign election observers, except those from South Africa. 2001 Ukraine's President Tuchman, protected by thousands of policemen, conducts a ceremony in memory of national poet Sevchenko. Angry demonstrators protest against Tuchman dictatorial ways. 2001 The price of Intel Corporation common stock (INTC) drops $3.81 to $29.44. It had traded as high as $74.88 (000828) and as low as $6.86 (960311) in the preceding 5 years. The computer chip maker had just lowered revenue estimates for the first quarter by about 25% and said it would cut its work force by 6% percent, or 5000 jobs. 2001 El Consejo de Ministros aprueba por decreto la suspensi�n del servicio militar obligatorio en Espa�a a partir del 31 Dec 2001. 2000 La filial mejicana del banco espa�ol BBVA se fusiona con Bancomer para dar lugar al primer banco de M�xico y uno de los principales de Latinoam�rica. La nueva entidad, BBVA-Bancomer, suma unos activos de 36'000 millones de d�lares (2,6 billones de pesetas). 1999 La polic�a francesa detiene en Par�s, en una operaci�n coordinada con la Guardia Civil española, a Jos� Javier Arizkuren "Kantauri", jefe de los comandos de ETA (Euskadi Ta Askatasuna) desde 1994, y a otros cinco integrantes de la banda terrorista. 1998 El Grupo de Contacto, organismo que vela por la paz en la antigua Yugoslavia, apoya una misi�n mediadora liderada por el ex presidente espa�ol, Felipe Gonz�lez Márquez, para frenar la violencia en Kosovo. 1998 El criminal general chileno Augusto José Ramón Pinochet Ugarte, nombrado tres d�a antes "comandante en jefe benem�rito", deja el mando del Ej�rcito, tras 65 a�os de carrera militar, y estrena su nuevo cargo de senador vitalicio. 1995 El juez Baltasar Garz�n decide enviar al Tribunal Supremo la denuncia de Luis Rold�n Ibáñez en la que acusa al vicepresidente Narc�s Serra i Serra, al ministro Garc�a Vargas y a los ex ministros Jos� Barrionuevo Peña y Jos� Luis Corcuera Cuesta de malversaci�n de caudales p�blicos por el uso irregular de los fondos reservados. 1994 La Comisi�n de Derechos Humanos de la ONU condena por primera vez formalmente el antisemitismo y la xenofobia. 1994 Termina en Francia el proceso de la sangre contaminada de sida con la absoluci�n del ex primer ministro socialista Laurent Fabius y su ministra de Solidaridad y Asuntos Sociales, Georgine Dufaux. CompuServe announced it would offer Internet access to its 1.7 million members on this day in 1994. The increasing popularity of the Internet led most online services first to offer, then to emphasize, Web access. Within two years, the Internet (especially the World Wide Web) ended the reign of the online services. While AOL prospered, most other leading online service providers folded or transformed into Internet service providers. In February 1998, WorldCom purchased CompuServe and sold its online subscriber list to America Online. The struggling WordStar International, Inc. purchases a word processing program for Macintosh computers, in an attempt to enter the market for Apple word processing. WordStar, once the market leader in word processing programs, began to lose ground after 1981 when IBM introduced the IBM PC, which used PC-DOS, a new operating system, instead of the previous standard, CP/M. Designed for CP/M, WordStar was slow to port to the new operating system and quickly lost ground to WordPerfect. In 1994, WordStar merged with Spinnaker Software and SoftKey Software Products to create SoftKey International. 1992 Espa�a y Croacia establecen relaciones diplom�ticas. 1991 Mario Alberto Soares toma posesi�n como presidente de la Rep�blica de Portugal en su segundo mandato. 1989 Eastern Airlines files for bankruptcy. 1989 Soviet Union officially submits to jurisdiction of the World Court. 1986 Mario Alberto Soares asume la Presidencia de Portugal. 1984 La ONU aprueba una convenci�n internacional contra la tortura. 1981 Auto de procesamiento contra el teniente general Jaime Milans del Bosch, acusado de delito de rebeli�n militar. 1980 El PNV (Partido Nacionalista Vasco) gana las elecciones al Parlamento vasco. 1975 Work begins on the Alaskan oil pipeline. The US Marines turn over control of the five northernmost provinces in South Vietnam to the US Army. The Marines had been responsible for this area since they first arrived in South Vietnam in 1965. The change in responsibility for this area was part of President Richard Nixon's initiative to reduce US troop levels as the South Vietnamese accepted more responsibility for the fighting. After the departure of the 3rd Marine Division from Vietnam in late 1969, the 1st Marine Division was the only marine division left operating in South Vietnam. The 3500 Marines of the 9th Marine Expeditionary Brigade under Brig. Gen. Frederick J. Karch continue to land at Da Nang. The Marines had begun disembarking from the USS Henrico, Union, and Vancouver on March 8 and were the first US combat troops in South Vietnam. Among the arrivals on this day were the first US armor in Vietnam--a tank of the 3rd Marine Tank Battalion. More tanks, including those with flame-throwing capability, followed in a few days. There was scattered firing from Viet Cong soldiers hidden ashore as the Marines landed, but no Marines were hit. The Marines were at once assigned to protect the US base at Da Nang, both from the immediate perimeter and from the high ground along a ridge to the west. Many others eventually joined this initial contingent of Marines. During the course of the war, the Marine Corps deployed one corps-level headquarters, two Marine divisions, two additional Marine regimental landing teams and a reinforced Marine aircraft wing, plus a number of battalion-size Marine special landing forces afloat with the 7th Fleet. Present at the beginning of US commitment to the Vietnam War, the Marine Corps was also there at the end. In 1975, Marine Corps elements took part in the final evacuation of South Vietnam as the country fell to the North Vietnamese. 1965 Three white Unitarian ministers, including the Rev. James J. Reeb, were attacked with clubs on the streets of Selma, Alabama, while participating in a civil rights demonstration. Reeb later died in a Birmingham, Alabama hospital. 1961 Sputnik 9 carries Chernushka (dog) into orbit. 1955 Nikita Sergeievich Kruschev es nombrado secretario general del Partido Comunista de la Uni�n Sovi�tica. ^ 1954 Red Scare McCarthy rebuked even by his fellow Republican US Senators. Senate Republicans level criticism at fellow Republican Joseph McCarthy and take action to limit his power. The criticism and actions were indications that McCarthy's glory days as the most famous investigator of communist activity in the United States were coming to an end. A Republican senator from Wisconsin, McCarthy had risen to fame in early 1950 when he stated in a speech that there were over 200 known communists operating in the US Department of State. Various other charges and accusations issued forth from McCarthy in the months and years that followed. Although he was notably unsuccessful in discovering communists at work in the United States, his wild charges and sensational Senate investigations grabbed headlines and his name became one of the most famous in America. Republicans at first embraced McCarthy and his devastating attacks on the Democratic administration of President Harry S. Truman. However, when McCarthy kept up with his charges about communists in the government after the election of Republican Dwight D. Eisenhower in 1952, the party turned against him. Eisenhower himself was particularly disturbed by McCarthy's accusations about communists in the US Army. On 09 March 1954, Republican Senator Ralph Flanders (Vermont) verbally blasted McCarthy, charging that he was a "one-man party" intent on "doing his best to shatter that party whose label he wears." Flanders sarcastically declared, "The junior Senator from Wisconsin interests us all, no doubt about that, but also he puzzles some of us. To what party does he belong? Is he a hidden satellite of the Democratic Party, to which he is furnishing so much material for quiet mirth?" In addition to Flanders' speech, Senate Republicans acted to limit McCarthy's ability to conduct hearings and to derail his investigation of the US Army. McCarthy's days as a political force were indeed numbered. Also, influential newsman Edward R. Murrow, on his See it Now program, criticizes McCarthy. During his televised hearings into the US Army later in 1954, the American people got their first look at how McCarthy bullied witnesses and ignored procedure to suit his purposes. By late 1954, the Senate censured him, but he remained in office until his death in 1957. His legacy was immense: during his years in the spotlight, he destroyed careers, created a good deal of hysteria, and helped spread fear of political debate and dissent in the United States. 1945 The Japanese occupiers proclaim the "independence" of Indo-China. ^ 1945 US planes on their way to kill Tokyo civilians by firebombing. US warplanes launch a new bombing offensive against Japan. They are on their way to drop 2000 tons of incendiary bombs on Tokyo, with the intention of killing great numbers of civilians. After they reached their target shortly after midnight on 10 March, some 40 square kilometers in and around the Japanese capital were incinerated, and between 80'000 and 130'000 Japanese civilians were killed in the worst single firestorm in recorded history. Early on 09 March, Air Force crews met on the Mariana Islands of Tinian and Saipan for a military briefing. They were planning a low-level bombing attack on Tokyo that would begin that evening, but with a twist: Their planes would be stripped of all guns except for the tail turret. The decrease in weight would increase the speed of each Superfortress bomber-and would also increase its bomb load capacity by 65%, making each plane able to carry more than seven tons. Speed would be crucial, and the crews were warned that if they were shot down, all haste was to be made for the water, which would increase their chances of being picked up by US rescue crews. Should they land within Japanese territory, they could only expect the very worst treatment by civilians, as the mission that night was going to entail the deaths of tens of thousands of those very same civilians. "You're going to deliver the biggest firecracker the Japanese have ever seen," said US Gen. Curtis LeMay. The cluster bombing of the downtown Tokyo suburb of Shitamachi had been approved only a few hours earlier. Shitamachi was composed of roughly 750'000 people living in cramped quarters in wooden-frame buildings. Setting ablaze this "paper city" was a kind of experiment in the effects of firebombing; it would also destroy the light industries, called "shadow factories," that produced prefabricated war materials destined for Japanese aircraft factories. The denizens of Shitamachi never had a chance of defending themselves. Their fire brigades were hopelessly undermanned, poorly trained, and poorly equipped. At 17:34, Superfortress B-29 bombers took off from Saipan and Tinian, reaching their target at 00:15. on 10 March. 334 bombers, flying at a mere 150 meters altitude, dropped their loads, creating a giant bonfire fanned by 30-knot winds that helped raze Shitamachi and spread the flames throughout Tokyo. Masses of panicked and terrified Japanese civilians scrambled to escape the inferno, most unsuccessfully. The human carnage was so great that the blood-red mists and stench of burning flesh that wafted up sickened the bomber pilots, forcing them to grab oxygen masks to keep from vomiting. The raid lasted slightly longer than three hours. "In the black Sumida River, countless bodies were floating, clothed bodies, naked bodies, all black as charcoal. It was unreal," recorded one doctor at the scene. Only 243 American airmen were lost � considered acceptable losses. 1933 The US Congress, called into special session by newly inaugurated President Roosevelt, begins its "hundred days" of enacting New Deal legislation. Freshly inaugurated President Franklin Roosevelt capped off a frantic first week in office by submitting the Emergency Banking Act to Congress. The legislation came but four days after the president declared a "banking holiday" that temporarily shut down the nation�s beleaguered financial institutions. Although a legally dubious legal move, the "holiday" helped halt the recent run on banks that had either bankrupted or badly depleted numerous banks� holdings. The Banking Act was the next step in Roosevelt�s quick-hit revitalization plan; it gave the federal government considerable control over the nation�s banks, all in the name of returning the institutions to solvency. After little more than a half-hour of debate, the House passed the bill and paved the path for the relatively healthy banks to reopen their doors. And, on March 12 the President lifted the holiday and a handful of banking institutions were cautiously allowed to reenter the fray. Roosevelt�s gambits eased the public�s urge to seize back their deposits and bought the government time to enact legislation, most notably the Glass-Steagall Act of 1933, that helped stabilize the nation�s banks. Henry Pu Yi, who reigned as the last emperor of China from 1908 to 1912, becomes regent of the Japanese puppet state of Manchukuo, comprising the Rehe province of China and Manchuria. At the age of two, Henry Pu Yi, ascended to the Chinese throne as the last emperor of the Manchu dynasty and reigned for four years under the name of Hsuan T�ung. On October 11, 1911, the dynasty fell to a republican revolution led by Chinese nationalist Sun Yat-sen, and in the next year Pu Yi was forced to abdicate. The new Chinese republican government granted him a large government pension and permitted him to live in Beijing�s Forbidden City until 1924, when he was forced into exile. After 1925, he lived in Japanese-occupied Tianjin, and in 1932, with the creation of Manchukuo by the Japanese authorities, he became regent of the puppet state. Two years later, he was enthroned as K�ang Te, the sole emperor of Manchukuo. Despite guerilla resistance against his puppet regime, he held the emperor�s title until 1945, when he was captured by Soviet troops. In 1946, Pu Yi testified before the Tokyo war crimes tribunal that he had been the unwilling tool of the Japanese and not, as they claimed, an instrument of Manchurian self-determination. Manchuria and the Rehe province were returned to China, and in 1950, Pu Yi was handed over to the Chinese Communists, who imprisoned him at Shenyang until 1959, when Chinese leader Mao Zedong granted him amnesty. 1932 Eamon De Valera becomes president of Ireland  Constituci�n del Gobierno del Estado libre de Irlanda, presidido por Eamon de Valera. 1923 Su enfermedad obliga a Lenin a abandonar definitivamente el poder en la URSS. 1917 Manifestaci�n obrera en San Petersburgo, contra la que los cosacos se resisten a cargar. Alborea la revoluci�n rusa. ^ 1916 Germany declares war on Portugal. On 07 August 1914, President de Arriaga of Portugal had declared his support for the Allies. At this time, Portugal had over 33'000 men in its army. By November 1914, Portuguese troops were involved in skirmishes with German troops on the frontier between Mozambique and German East Africa. However, this did not provoke a full-scale declaration of war. In February, 1916, the Portuguese government ordered its navy to seize German ships in its harbors. Germany responded by declaring war on Portugal. About 100'000 Portuguese eventually fought with the Allies on the Western Front and in Mozambique. The army suffered 21'000 casualties, including over 7000 dead. 1865 Battle of Kinston (Wise's Fork), North Carolina continues. During the American Civil War, the CSS Virginia, a captured and rebuilt Union steam frigate formerly known as the Merrimack, engages the USS Monitor in the first battle between iron-fortified naval vessels in history. The Confederate navy�s innovative addition of iron plates to the captured USS Merrimack steam frigate temporarily made it an unstoppable force in the disputed waters of the Civil War, encouraged the Union navy to construct its own ironclad, the USS Monitor. On 08 March 1862, the Virginia attacked a Union squadron of wooden-hulled vessels in Hampton Roads off the Virginia coast. The USS Congress, a frigate, and the USS Cumberland, a sailing sloop, were easily sunk by the Virginia, which suffered no noticeable damage. Late that night, the USS Monitor arrived in the area, and despite its unassuming appearance, with its deck nearly at the water level, the Monitor would prove a formidable match for the Confederate ironclad. The next day, the two vessels engaged each other, and both the Monitor and the Virginia suffered direct hits which failed to penetrate their iron shells. Finally after four hours, a cannon blast from the Virginia hit the Monitor�s pilothouse, temporarily blinding ship�s captain, Union Lieutenant John L. Worden. The Virginia was thus allowed to escape to Norfolk, Virginia, and the Battle of the Ironclads ended in a draw. Two months later, the Virginia was trapped in Norfolk by advancing Union forces, and its Confederate crew blew up the innovative vessel rather than allow it to fall into Union hands. 1861 Confederate currency authorized  $50, $100, $500, $1000. 1860 First Japanese ambassador to US arrives in San Francisco en route to Washington. During the Mexican-American War, US forces under General Winfield Scott invade Mexico three miles south of Vera Cruz. Encountering little resistance from the Mexicans massed in the fortified city of Vera Cruz, by nightfall the last of Scott's 10'000 men have come ashore without the loss of a single life. It is the largest amphibious landing in US history until World War II. The Mexican-American War began with a dispute over the US government's 1845 annexation of Texas. In January of 1846, President James K. Polk, a strong advocate of westward expansion, ordered General Zachary Taylor to occupy disputed territory between the Nueces and Rio Grande rivers. Mexican troops attacked Taylor's forces, and on 13 May 1846, Congress approved a declaration of war against Mexico. On 09 March 1847, General Scott's forces landed near Vera Cruz, and by 29 March, with very few American casualties, had taken the fortified city and its massive fortress, San Juan de Ulua. On 09 April, Scott began a devastating march to Mexico City, ending on 14 September, when triumphant US forces entered the Mexican capital and raised the American flag over the Hall of Montezuma. On 02 February 1848, representatives from the US and Mexico signed the Treaty of Guadalupe Hidalgo, formally ending the Mexican War, recognizing Texas as part of the United States, and extending the boundaries of the United States west to the Pacific Ocean. At the end of a historic case, the US Supreme Court rules, with only one dissent, that the African slaves who seized control of the Amistad slave ship had been illegally forced into slavery, and thus are free under US law. In 1807, the US Congress had joined with Great Britain in abolishing the African slave trade, although the trading of slaves within the US was not prohibited. Despite the international ban on the import of African slaves, Spain and Portugal continued to transport and accept captive Africans to their American colonies until the 1860s. On 28 June 1839, fifty-three slaves recently captured in Africa left Havana, Cuba, aboard the Amistad schooner for a life of slavery on a sugar plantation at Puerto Principe. Three days later, Sengbe Pieh, a Membe African known as Cinque [drawing >], freed himself and the other slaves and planned a mutiny. Early in the morning of 02 July 1839, in the midst of a storm, the Africans rose up against their captors and, using sugar cane knives found in the hold, killed the captain of the vessel and a crewmember. Two other crewmembers were either thrown overboard or escaped, and Jose Ruiz and Pedro Montes, the two Cubans who had purchased the slaves, were captured. Cinque ordered the Cubans to sail the Amistad east back to Africa. During the day Ruiz and Montes complied, but at night they would turn the vessel in a northerly direction, toward US waters. After almost nearly two difficult months at sea, during which time over a dozen Africans perished, the so-called "black schooner" was spotted by the first US vessels. On 26 August 1839, the USS Washington, a US Navy brig, seized the Amistad off the coast of Long Island, New York, and escorted it to New London, Connecticut. Ruiz and Montes were freed and the Africans were imprisoned pending an investigation of the Amistad revolt. The two Cubans demanded the return of their supposedly Cuban-born slaves, while the Spanish government called for the Africans' extradition to Cuba to stand trial for piracy and murder. In opposition to both groups, US abolitionists advocated the return of the illegally bought slaves to Africa. The story of the Amistad mutiny garnered widespread attention, and US abolitionists succeeded in winning a trial in a US court. Before a federal district court in Connecticut, Cinque, who was taught English by his new US friends, testified on his own behalf. On 13 January 1840, Judge Andrew Judson ruled that the Africans were illegally enslaved, that they would not be returned to Cuba to stand trial for piracy and murder, and that they should be granted free passage back to Africa. The Spanish authorities and US President Martin Van Buren appealed the decision but another federal district court upheld Judson's findings. President Van Buren, in opposition to the abolitionist faction in Congress, appealed the decision again and on 22 February 1841, the US Supreme Court began hearing the Amistad case. US Representative John Quincy Adams of Massachusetts, who served as the sixth president of the United States from 1825 to 1829, joined the Africans' defense team. In Congress, Adams had been an eloquent opponent of slavery, and before the nation's highest court he presented a coherent argument for the release of Cinque and the thirty-four other survivors of the Amistad. On 09 March 1841, Justice Story delivers the decision of the Supreme Court that the Africans had been illegally enslaved and had thus exercised a natural right to fight for their freedom. In November, with the financial assistance of their abolitionist allies, the Amistad Africans departed from the US aboard the Gentleman on a voyage back to West Africa. Some of the Africans helped establish a Christian mission in Sierra Leone, but most, like Cinque, returned to their homelands in the African interior. 1839 Se firman dos tratados entre M�xico y Francia que ponen fin a la Guerra de los Pasteles. 1820 Fernando VII jura la Constituci�n de 1812, obligado por el pueblo de Madrid. El rey vuelve a suprimir la Inquisici�n. 1780 Declaraci�n rusa relativa a la neutralidad armada, para limitar la intrusi�n de la marina brit�nica en los mares europeos. 1678 Rendici�n de Gante, defendida heroicamente por 500 espa�oles frente a 40'000 franceses. 1500 Zarpa de Lisboa la flota mandada por el portugu�s Pedro Alvarez Cabral con rumbo a la India, pero que descubri� el Brasil. 1497 Nicolaus Copernicus first recorded astronomical observation. 1496 Jews are expelled from Carintha Austria. ^ 0435 First day of the 10th baktun. 2005 Bart Ross, whose last known address was in the 4500 block of North Bernard Street in Chicago, shoots himself in his van, in West Allis, Wisconsin, at about 18:00 (24:00 UT). The van had been parked near a school. Noticing that it had Illinois license plates and seeing that the occupant was doing something suspicious (perhaps writing), policemen in a patrol car followed it when it left. The van had no taillights and made an illegal U-turn, so the police signaled it to stop. Ross shoots himself as a policeman approaches the van. Ross had a note that included that he had committed the 28 February 2005 murder of the husband and the mother of Judge Lefkow. Ross, representing himself without a lawyer, had filed a lawsuit in which he claimed that doctors at the University of Illinois-Chicago Hospital had committed a "terrorist act" in the early 90s by giving him radiation treatment for his cancer without his consent, and that it had disfigured him. The lawsuit first was ruled against twice before Judge Lefkow rejected it on a technicality in September 2004, and that cost Ross "his house, his job and family" according to the note. 2005 Twenty-seven students of San Jose Elementary School in Mabini, Bohol province, the Philippines, apparently poisoned by the fried balls of cassava (manioc) roots of the bulaghoy variety, which they had bought from a street vendor and eaten during their mid-morning break. Some 100 other children are violently ill, with abdominal pain and vomiting. and so is the vendor, a woman 68 years old. Cassava contains free and bound cyanogenic glucosides (producing the poisonous NaCN or KCN), so abundant in some varieties that they must be removed by processing. Symptoms of moderate poisoning include vomiting, convulsions, deep breathing, shortness of breath, and anxiety; more serious cases result in convulsions, loss of consciousness, and death after apnea and heart arrest. The lethal dose for adults is 200�300mg of potassium or sodium cyanide. 2005 New Zealander mountain guide Erica Beuzenberg, 41, and tourist climbers John Lowndes, 59, from England and Kazuhiro Kotani, 29, from Japan, roped together, one of the men slips and all three fall 200 meters down an ice slope on the western side of Ball Pass in the Aoraki-Mt Cook National Park, in the Southern Alps of New Zealand. He dies at George Washington University Hospital of complications after an 11-hour heart operation five days earlier. His heart disease was caused by diabetes, which is all too common on Nauru. Dowiyogo was in the US on official business. Born on 14 February 1946, Dowiyogo became an elected member of Nauru's 18-seat Parliament in 1973. He served his first term as president in 1976-1978 after ousting the island's head chief and first president, Hammer DeRoburt, who helped win independence from Australia on 31 January 1968. Over the next 25 years, Dowiyogo served as president for periods as long as six years and as short as 15 days. He became president for the sixth time in January 2003. During the 1980's, Dowiyogo earned a reputation in South Pacific politics for his sharp criticism of France and the United States for atomic weapons testing in the region. He was also known as one of Nauru's more pragmatic leaders, but one who never managed to stem the waste and corruption on an island that has been devastated by decades of phosphate mining, and now faces economic collapse. 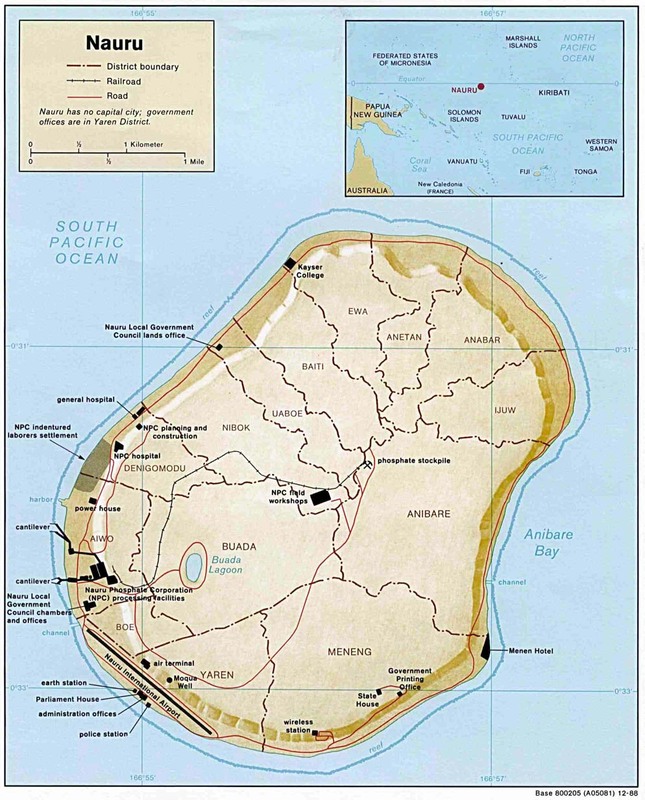 Nauru [<aerial photo], a 21-square-kilometer island (less than 6 km in its longest dimension) at 0º32' S 166º55' E (about half way between Hawaii and Australia), is the world's smallest independent republic, with 12'500 inhabitants as of this date. It is almost completely dependent on phosphate deposits, mined for use as fertilizer. Phosphate produced a great deal of wealth for island residents, but much of the money was squandered and the deposits are nearly exhausted. In addition, the mining has caused extensive damage to island's vegetation and soil, leaving the central 90% of Nauru a wasteland. Obtaining fresh water is a problem; roof storage tanks collect rainwater, but the island is mostly dependent on a single, aging desalination plant. Nauru's 2002 budget deficit was $15 million, about half its gross domestic product. The world's oldest (and the smallest besides Nauru) republic, founded in 301, San Marino, has an area of 61 square kilometers and a population of 28'000. Only two countries are smaller than Nauru. Monaco, which has an area of 1.95 sq km and a population of 32'000, is a principality. The world smallest country, the State of the Vatican City, has an area of 0.44 sq km and a population of 900 (all are immigrants), it is ruled by an absolute monarch (the Pope) elected for life by an electoral college (the cardinals) chosen by his predecessors. In 2001, Nauru agreed to accept hundreds of refugees from Afghanistan, Iraq and other countries who had traveled by boat to seek asylum in Australia, and who were not among those who died at sea when Australia heartlessly intercepted them. In exchange, Nauru receives $10.6 million a year in aid from Australia. 2002 Elkana Gobi, 20, Israeli corporal, from Neveh Dekalim, intentionally run over by an Israeli army jeep, in the evening. Near the Kissufim junction in the Gaza Strip. Palestinians had fired at the car where Gody and another Israeli were traveling, the passengers went out of the car to return fire. Israeli soldiers driving a military patrol jeep mistook the Israelis for Palestinian gunmen and ran over Gobi. 2002 Samer Awis, Fatah activist, by a missile fired from an Israeli helicopter in Ramallah, which was possibly intended for his brother Abed al-Karim Awis, one of the heads of the Al-Aqsa Martyrs Brigade. 2002: Limor Ben-Shoham, 27; Livnat Dvash, 28; Tali Eliyahu, 26; Dan Imani, 23; Orit Ozerov, 28; Avraham Haim Rahamim, 28; all 6 of Jerusalem; and Nir Borochov, 22; and Uri Felix, 25, both of Givat Ze'ev; Natanel Kochavi, 31, of Kiryat Ata; Baruch Lerner, 29, of Eli; Danit Dagan, 25, of Tel-Aviv; and suicide bomber Fuad Horani, an Al-Aqsa Martyrs Brigade resident in the Al Arroub refugee camp south of Bethlehem in the West Bank, at 22:30 in the Moment garden café in the Rehavia neighborhood in the center of Jerusalem, at the corner of Ben-Maimon Street across Aza Street from Prime Minister Ariel Sharon's residence. 54 persons are injured. 2002 Avia Malka, 9-month, from South Africa; Israel Yihye, 27, of Bnei Brak; and two Palestinian gunmen of Al-Aqsa Brigades, who, at 20:30, throw hand grenades and fire guns in the Jeremy Hotel in Netanya at people leaving after a traditional Shabbat hatan pre-wedding celebration. Israeli border policemen pursue and shoot the fleeing gunmen. Next to their bodies is found Yihye killed, possibly by police gunfire. 2002 Rana Jayousi, 21, and her baby about to be born, Palestinians, after being stopped by the Israeli soldiers at the Tolkarem roadblock, West Bank, and prevented to proceed to the hospital and ordered to return home. 2001 Stanko Miladinovic, Serbian police officer, by mortar shell fired by Ethnic Albanian guerillan into a police outpost in village of Lucane, near Kosovo, at 09:40. 2001 I�aki Totorika Vega, agente de la Ertzaintza, asesinado en Hernani (Guip�zcoa) mediante una bomba colocada por ETA (Euskadi Ta Askatasuna) en el maletero de su veh�culo. 1997 Christopher Wallace Biggie Smalls The Notorious B.I.G., a gangster-rapper, shot at a stoplight in Los Angeles, weeks before the scheduled release of his album Life After Death, possibly in retaliation for the murder of rival Tupac Shakur 6 months earlier. ^ 1995 Scott Amedure, 32, murdered by Jonathan Schmitz, 24. Schmitz had agreed to appear on a secret admirers segment of the Jenny Jones TV show. At the taping of the show (which was never broadcast) on 06 March 1995, Schmitz found out that his secret admirer was not a woman, but his friend and neighbor Amedure, an unemployed homosexual man, who told the audience about a fantasy that involved Schmitz, some whipped cream, strawberries and champagne, he became embarrassed and, his lawyers would later say, enraged. Three days after the taping, on 09 March 1995, Schmitz receives an anonymous, sexually suggestive note on his doorstep and assumed it came from Amedure. Schmitz purchases a 12-gauge shotgun and ammunition, goes to Amedure's mobile home, and fires two shots at close range into Amedure's chest. A few minutes later, Schmitz dials 911 from a pay phone at a gas station near his sister's house. He says "I just walked in the room and killed him." On 07 May 1999, at the conclusion of a civil �wrongful-death� death suit, a Michigan jury would find the producers of the "The Jenny Jones Show" negligent and responsible for the events that led to the murder and award Amedure's family $6500 in funeral and burial expenses, $5 million for Amedure's pain and suffering, and $10 million each for loss of companionship and compensation. One of the nine jurors sided with the defendants, but eight jurors were enough for a verdict in favor of the Amedure family. In a criminal trial, Schmitz was charged with first-degree murder and committing a felony with a firearm. To convict him of first-degree murder, prosecutors had to prove that the murder was premeditated, which would mandate a sentence of life imprisonment without the possibility of parole. The jury was allowed to consider lesser charges, such as second-degree murder or manslaughter. Though Schmitz may have been embarrassed by the Jenny Jones taping, it did not justify his killing Amedure, the state argued. Schmitz drove to one store to purchase a shotgun, drove to another for ammunition, and drove to Amedure's home before firing the fatal shots. That demonstrates premeditation, prosecutors said. Prosecutors contended that when Schmitz went to Amedure's mobile home, Schmitz became violent. They say that a police report indicating an upturned chair at the crime scene shows that Amedure was trying to defend himself. The State had an oral confession and a videotaped confession. In a pretrial hearing, however, the judge ruled that both confessions were inadmissible because the oral confession was made without Schmitz being read his Miranda rights and the videotaped confession was made while his right to counsel was being violated. Schmitz's attorneys argued the defense of diminished capacity. They claimed Schmitz lacked the mental state required to have committed premeditated murder when he shot Amedure. According to the defense's theory, Schmitz simply snapped after finding the note on his doorstep. Lawyers attributed Schmitz' reaction to Grave's disease -- a thyroid gland disorder that can cause irrational and violent behavior -- and manic depression. On 12 November 1996, the jury dismissed first-degree murder (premeditated), and found Jon Schmitz guilty of second-degree murder (intentional but not premeditated) and illegal possession of a firearm in commission of a felony. On 04 December 1996, he was sentenced to 25 to 50 years in prison, with parole possible after 20 years. However this conviction would be overturned by the the Michigan Court of Appeals in September 1998, ruling that the judge had mishandled the three-day jury selection process. The defense wanted to remove a juror on the last day, but the prosecution objected since the defense had no objection the previous day. The judge sided with the prosecution, but the state appeals court ruled that the defense should have the right to remove a juror at any time. On 26 August 1999, after three hours of deliberations, jurors in the retrial find Jonathan Schmitz guilty of second-degree murder. The twelve-member jury, composed of seven women and five men, concluded that Amedure was not to blame for his own slaying, as the defense had argued throughout the trial. The three-day delay between the taping of the show and the killing seems to have convinced the jurors of the guilt of Schmitz. On 14 September 1999, Jonathan Schmitz would receive the maximum sentence, as in the first trial, 25-to-50-year in prison. ^ 1992 Menachem Wolfovitch Begin, Israeli prime minister (21 Jun 1977 – Oct 1983), born in Russia on 16 August 1913. Begin received a law degree from the University of Warsaw in 1935. Active in the Zionist movement throughout the 1930s, he became (1938) the leader of the Polish branch of the Betar youth movement, dedicated to the establishment of a Jewish state on both sides of the Jordan River. When the Germans invaded Warsaw in 1939, he escaped to Vilnius; his parents and a brother died in concentration camps. The Soviet authorities deported Begin to Siberia in 1940, but in 1941 he was released and joined the Polish army in exile, with which he went to Palestine in 1942. Begin joined the Zionist terrorist organization Irgun Zvai Leumi (“National Military Organization”) [1931-1948], and was its commander from 1943 to 1948. After Israel's independence in 1948 the Irgun formed the Herut (�Freedom�) Party with Begin as its head and leader of the opposition in the Knesset (Parliament) until 1967. Begin joined the National Unity government (1967�70) as a minister without portfolio and in 1970 became joint chairman of the Likud (�Unity�) coalition. On 17 May 1977, the Likud Party won a national electoral victory and on 21 June 1977 Begin formed a government. He was perhaps best known for his uncompromising stand on the question of retaining the West Bank and the Gaza Strip, which had been occupied by Israel during the Arab-Israeli War of 1967. Prodded by US President Jimmy Carter [01 Oct 1924~], however, Begin negotiated with President Anwar el-Sadat [25 Dec 1918 – 06 Oct 1981] of Egypt for peace in the Middle East, and the agreements they reached, known as the Camp David Accords (17 September 1978), led directly to a peace treaty between Israel and Egypt that was signed on 26 March 1979. Under the terms of the treaty, Israel returned the Sinai Peninsula, which it had occupied since the 1967 war, to Egypt in exchange for full diplomatic recognition. Begin and Sadat were jointly awarded the Nobel Prize for Peace in 1978. Begin formed another coalition government after the general election of 1980. Despite his willingness to return the Sinai Peninsula to Egypt under the terms of the peace agreement, he remained resolutely opposed to the establishment of a Palestinian state in the West Bank and Gaza Strip. In June 1982 his government mounted an invasion of Lebanon in an effort to oust the Palestine Liberation Organization (PLO) from its bases there. The PLO was driven from Lebanon, but the massacre of numerous Palestinian civilians there turned world opinion against Israel. Israel's continuing involvement in Lebanon, and the death of Begin's wife in November 1982, were probably among the factors that prompted him to resign from office in October 1983. 1989 Robert Mapplethorpe, fot�grafo estadounidense. 1988 Kurt Georg Kiesinger, ex canciller de la RFA. 1977 One person killed by a dozen armed Hanafi Muslims who invade three buildings in Washington DC, taking more than 130 hostages. The siege ended two days later. 1943 Otto Freundlich, born in Germany in 1878, painter and sculptor active in France. — more with links to images. ^ 1940 Day 101 of Winter War: USSR aggression against Finland. More deaths due to Stalin's desire to grab Finnish territory. Rear Line breached by two enemy divisions north of Viborg but main defensive line again in Finnish hands by midnight. The Soviet Union is continuing its massive offensive against the Finnish backline positions. An attack in the morning by two Soviet divisions shatters the Finnish backline defences in Tali. The defending Finnish battalion loses 44 per cent of its strength in the savage engagement. Despite their heavy losses, the Finns still attempt a counterattack towards Tali at 2 o'clock in the afternoon, but without success. Tali village falls to the enemy. In the evening the Finnish troops regroup in defensive formations on a line cutting through the southern head of Lake Leitimoj�rvi and the eastern head of Lake K�rstil�nj�rvi. Some of the men are in a state of panic. Divisional staff is forced to ask for additional military policemen to pick up deserters from the front line. In Taipale, the Finnish troops manage to evacuate the Terenttil� stronghold without the Russians realising what is going on. The Finnish force in Viipurinlahti bay withdraws from Lihaniemi promontory and Hapenensaari and Piispansaari islands. On the western side of the bay the Soviet troops sever the new trunk road from Viipuri to S�kkij�rvi. In the Kollaa sector in Ladoga Karelia the enemy offensive continues unabated, with strongholds changing hands several times during the course of the day. One of Finland's leading gymnasts, Reserve Lieutenant Martti 'Make' Uosikkinen is killed in Kollaa. By midnight the entire main defensive line is once again in Finnish hands. Approximately 70 Finnish aircraft strafe enemy troops and columns in Viipurinlahti bay. In an ensuing dogfight, the Finns shoot down three enemy fighters. One Finnish plane is lost and three damaged. Finnish pilots spot over 400 enemy trucks carrying infantry, and over 50 assault tanks on the roads to the south of Lake Suvanto on the eastern Isthmus. The Finnish Government convenes at 5 o'clock in the afternoon to consider the telegrams sent by the delegation at the Moscow peace talks. The assembled ministers are shocked by the proposed loss of access to Lake Ladoga and the cession of the district of Salla in Lapland. The session is interrupted by an important telephone call from Commander-in-Chief Mannerheim, and reconvenes at 22:00. The Government is able to draw on an assessment of the military situation prepared by General Heinrichs, commander of the Army of the Isthmus. Heinrichs' pessimistic assessment forces the Commander-in-Chief to conclude that there is no alternative but to accept the Soviet Union's peace terms. Neuvostoliiton suurhy�kk�ys jatkuu Suomen taka-asemaa vastaan. Aamulla kahden neuvosto-divisioonan voimin tekem� hy�kk�ys ly� hajalle suomalaisten taka-aseman puolustuksen Talissa. Ankaran taistelun j�lkeen suomalaispataljoona k�rsii 44 prosentin tappiot. Iltap�iv�ll� klo 14 suomalaiset viel� yritt�v�t vastahy�kk�yst� Talin suuntaan, tuloksetta. Talin kyl� joutuu vihollisen haltuun. Illalla joukot saadaan ryhmitetyksi puolustukseen Leitimoj�rven etel�p��n - K�rstil�nj�rven it�p��n tasalle. Osa miehist� on pakokauhun vallassa. Divisioonan esikunta joutuu pyyt�m��n lis�� sotapoliiseja etulinjasta karanneiden pid�tt�miseksi. Taipaleessa tyhjennet��n Terenttil�n tukikohta ven�l�isten huomaamatta. Viipurinlahdella suomalaiset vet�ytyv�t Lihaniemest�, Hapenensaaresta ja Piispan-saaresta. L�nsirannalla neuvostojoukot katkaisevat Viipurin-S�kkij�rven uuden maantien. Kollaan suunnalla vihollinen jatkaa hy�kk�yst��n ja tukikohdat vaihtavat p�iv�n aikana useasti omistajaa.BR> Yksi maamme parhaita voimistelijoita, reservin luutnantti Martti "Make"Uosikkinen kaatuu Kollaalla. Keskiy�ll� p��linja on taas kauttaaltaan suomalaisten hallussa. Lentorykmentti tekee konekiv��ri-hy�kk�yksi� noin 70 koneella vihollisen joukkoja ja kolonnia vastaan Viipurinlahdella. Syntyneess� ilmataistelussa ammutaan alas kolme vihollish�vitt�j��. Yksi oma kone tuhoutuu ja kolme vaurioituu. Suomalaiset lent�j�t havaitsevat yhteens� yli 400 vihollisen kuorma-autoa kuljettamassa jalkav�ke� sek� yli 50 hy�kk�ysvaunua Suvannon etel�npuoleisilla teill�. Hallitus kokoontuu klo 17 pohtimaan rauhanvaltuuskunnan l�hett�mi� s�hkeit�. Rauhanehdoissa tyrmistytt�v�t yhteyden menett�minen Laatokkaan ja Sallan alueen luovuttaminen. Istunto keskeytyy ylip��llikk� Mannerheimin t�rke��n puhelinviestiin. Hallitus kokoontuu uudelleen klo 22. Hallituksella on k�ytett�v�n��n Kannaksen armeijan komentajan, kenraali Heinrichsin laatima sotilallinen tilannekatsaus. Pessimistinen tilannetiedotus pakottaa ylip��llik�n muodostamaan oman kantansa: rauhanehtoihin on suostuttava. Sovjetunionens storoffensiv mot Finlands bakre st�llning forts�tter. P� morgonen splittrar tv� ryska divisioner det finska f�rsvaret av den bakre st�llningen i Tali. Efter en f�rbittrad kamp lider den finska bataljonen f�rluster p� 44 procent. Kl. 14 p� eftermiddagen f�rs�ker finnarna �n en g�ng g� till motattack i riktning Tali, men utan resultat. Tali by faller i fiendens h�nder. P� kv�llen lyckas man gruppera trupperna f�r f�rsvar p� sektorn mellan Leitimoj�rvis s�dra �nda och K�rstil�nj�rvis �stra �nda. En del av soldaterna grips av panik. Staben f�r divisionen m�ste be om extra milit�rpoliser f�r att ta fast soldater som rymt fr�n den fr�mre linjen. I Taipale t�mmer man basen i Terenttil� utan att ryssarna m�rker det. I Viborgska viken retirerar finnarna fr�n Lihaniemi, Hapenensaari och Piispansaari. P� v�stkusten sk�r de ryska trupperna av den nya landsv�gen mellan Viborg och S�kkij�rvi. Vid Kollaa forts�tter fienden att anfalla och baserna byter flera g�ngen �gare under dagen. En av Finlands fr�msta gymnaster, reservl�jtnant Martti "Make"Uosikkinen stupar i Kollaa. Vid midnatt �r huvudlinjen igen i sin helhet i finnarnas besittning. Ett flygregemente p� ungef�r 70 plan beskjuter fiendens trupper och kolonn i Viborgska viken med maskingev�r. Det uppst�r en luftstrid d�r finnarna skjuter ner tre fientliga jaktplan. En av de egna planen f�rst�rs och tre skadas. Finska piloter uppt�cker sammanlagt drygt 400 fientliga lastbilar som transporterar infanteri och �ver 50 stridsvagnar p� v�garna s�der om Suvanto. Regeringen sammantr�der kl. 17 f�r att behandla telegrammen som kommit in fr�n fredsdelegationen. De mest uppr�rande punkterna i fredsvillkoren �r att v�rt land skulle vara tvunget att klippa av f�rbindelsen till Ladoga och �verl�ta omr�det kring Salla �t Sovjetunionen. Sessionen avbryts av ett viktigt telefonmeddelande till �verbef�lhavare Mannerheim. Regeringen sammantr�der p� nytt kl. 22. Regeringen tar del av den milit�ra l�gesrapporten som sammanst�llts av kommend�ren f�r arm�n p� N�set, general Heinrichs. Den pessimistiska l�gesrapporten tvingar �verbef�lhavaren att ta st�llning: Finland m�ste godk�nna fredsvillkoren. 1925 Willard Leroy Metcalf, US painter born on 01 July 1858.  MORE ON METCALF AT ART 4 JULY with links to images. 1924 Daniel Ridgway Knight, US painter born on 15 March 1839.  MORE ON KNIGHT AT ART 4 MARCH 15 with links to images. ^ 1916: 17 US persons, and dozens of Villa's soldiers who killed them on US soil. to demonstrate that Venustiano Carranza does not control northern Mexico, Mexican guerrillas under the command of Francisco "Pancho" Villa crossed the US-Mexican border in January 1916 and execute 16 US persons at Santa Isabel. In In the early morning of 9 March, in a new incursion, Villa's troops attack the small border town of Columbus, New Mexico. Seventeen Americans are killed in the raid, and the center of town is burned. It was unclear whether Villa personally participated in the attack, but President Woodrow Wilson ordered the US Army into Mexico to capture the rebel leader dead or alive. Before he invaded the United States, Pancho Villa was already known to Americans for his exploits during the Mexican Revolution. In 1909 Villa joined Francisco Madero's uprising against the dictator of Mexico, Porfirio D�az. During the rebellion, Villa, who lacked a formal education but had learned to read and write, displayed his talents as soldier and organizer. Combined with his intimate knowledge of the land and the people of northern Mexico, these gifts enabled him to place at Madero's disposal a division of trained soldiers under his command. After the success of the revolution with Diaz's 25 May 1911 resignation, Villa remained in the irregular army. Villa led the famous Divisi�n del Norte, with its brilliant cavalry, Los Dorados, and won control of northern Mexico after a series of audacious attacks. In 1914, following the resignation of Mexican leader Victoriano Huerta, Pancho Villa and his former revolutionary ally Venustiano Carranza battled each other in a struggle for succession. By the end of 1915, Villa had been driven north into the mountains, and the US government recognized General Carranza as the president of Mexico. In January 1916, to protest President Woodrow Wilson's support for Carranza, Villa executed 16 US citizens at Santa Isabel in northern Mexico. Then, in early March, he ordered the raid on Columbus. Cavalry from the nearby Camp Furlong US Army outpost pursued the Mexicans, killing several dozen rebels on US soil and in Mexico before turning back. On 15 March, under orders from President Wilson, US Brigadier General John J. Pershing launched a punitive expedition into Mexico to capture Villa and disperse his rebels. The expedition eventually involved some 10'000 US soldiers and personnel. It was the first US military operation to employ mechanized vehicles, including automobiles and airplanes. For 11 months, Pershing failed to capture the elusive revolutionary, who was aided by his intimate knowledge of the terrain of northern Mexico and his popular support from the people there. Meanwhile, resentment over the US intrusion into Mexican territory led to a diplomatic crisis with the government in Mexico City. On June 21, the crisis escalated into violence when Mexican government troops attacked a detachment of the 10th Cavalry at Carrizal, Mexico, leaving 12 US dead, 10 wounded, and 24 captured. The Mexicans suffered more than 30 dead. If not for the critical situation in Europe, war might have been declared. In January 1917, having failed in their mission to capture Villa, and under continued pressure from the Mexican government, the Americans were ordered home. Villa continued his guerrilla activities in northern Mexico until Adolfo de la Huerta took power over the government and drafted a reformist constitution. Villa entered into an amicable agreement with Huerta and agreed to retire from politics. In 1920, the government pardoned Villa, but three years later he was assassinated at his ranch in Parral. Angered over American support of his rivals for the control of Mexico, the peasant-born revolutionary leader Pancho Villa attacks the border town of Columbus, New Mexico. In 1913, a bloody civil war in Mexico brought the ruthless general Victoriano Huerta to power. American President Woodrow Wilson despised the new regime, referring to it as a "government of butchers," and provided active military support to a challenger, Venustiano Carranza. Unfortunately, when Carranza won power in 1914, he also proved a disappointment and Wilson supported yet another rebel leader, Pancho Villa. A wily, peasant-born leader, Villa joined with Emiliano Zapata to keep the spirit of rebellion alive in Mexico and harass the Carranza government. A year later, though, Wilson decided Carranza had made enough steps towards democratic reform to merit official American support, and the president abandoned Villa. Outraged, Villa turned against the United States. In January 1916, he kidnapped 18 Americans from a Mexican train and slaughtered them. A few weeks later, on this day in 1916, Villa led an army of about 1500 guerillas across the border to stage a brutal raid against the small US town of Columbus, New Mexico. Villa and his men killed 19 persons and left the town in flames. Now determined to destroy the rebel he had once supported, Wilson ordered General John Pershing to lead 6000 US soldiers into Mexico and capture Villa. Reluctantly, Carranza agreed to allow the US to invade Mexican territory. For nearly two years, Pershing and his soldiers chased the elusive Villa on horseback, in automobiles, and with airplanes. The US troops had several bloody skirmishes with the rebels, but Pershing was never able to find and engage Villa. Finally losing patience with the US military presence in his nation, Carranza withdrew permission for the occupation. Pershing returned home in early 1917, and three months later left for Europe as the head of the US Expeditionary Force of World War I. Though Pershing never captured Villa, his efforts did convince Villa never again to attack US citizens or territory. After helping remove Carranza from power in 1920, Villa agreed to retire from politics. His enemies assassinated him in 1923. The resentment engendered in Mexico by the efforts against Pancho Villa, however, did not fade with his death, and Mexico-US relations remained strained for decades to come. 1904 Erskine Nicol, British painter born on 03 July 1825. A fire destroys the Olds Motor Works factory in Detroit, Michigan. Legend holds that Olds employee James Brady pushed a Regular Runabout, affectionately called the Curved Dash, out of the building to safety. Over the course of the previous year, Olds had developed over eleven models for cars, all of which varied greatly in price and design. He had reportedly not decided which Olds models on which to focus the company�s production capability, but, as the first destroyed all but one prototype, fate decided that the Runabout would be the first major production Olds. The Runabout, a small buggy with lightweight wheels and a curved dashboard powered by a one-cylinder engine not dissimilar from today�s lawnmower engines, became the Olds Motor Company�s primary automobile. The Runabout could reach 30 km/h. In preparation for his success, Olds contracted other companies for parts to comprise his Runabout and in doing so he revolutionized the automobile industry. Previously, all cars had been built from start to finish in one site. Olds�s methods allowed for an assembly line in which parts were produced outside his factory and systematically assembled in his own factories. Among Olds subcontracted partners were the Dodge Brothers, Henry Leland who founded Lincoln and Cadillac, and Fred Fisher whose family produced bodies for GM. The Olds Runabout sold for $650. 1895 Leopold Ritter von Sacher-Masoch, escritor austr�aco, con cuyo nombre se asocia la palabra masoquismo. 1888 Wilhelm I Friedrich Ludwig, born on 22 March 1797, king of Prussia since the death of his childless brother Friedrich Wilhelm IV [15 Oct 1795 – 02 Jan 1861], and German Emperor since 18 January 1871. Otto von Bismarck [01 Apr 1815 – 30 Jul 1898] was his prime minister of Prussia (from September 1862) and chancellor of Germany. 1885 Louis Haghe, Belgian artist born on 17 March 1806. 1869 Louis-Hector Berlioz, French composer, critic, and conductor of the Romantic period, born on 11 December 1803. He is known largely for his Symphonie fantastique (1830), the choral symphony Rom�o et Juliette (1839), and the dramatic piece La Damnation de Faust (1846). His last years were marked by fame abroad and hostility at home. 1857 Domenico Savio, Italian teenaged saint born on 02 April 1842. In 1854 he became a student at the Oratory of Saint John Bosco [16 Aug 1815 – 31 Jan 1888], who became his confessor. 1851 Hans Christian �rsted, born on 14 August 1777, Danish physicist and chemist who discovered that electric current in a wire can deflect a magnetized compass needle, a phenomenon the importance of which was rapidly recognized and which inspired the development of electromagnetic theory. In 1806 �rsted became a professor at the University of Copenhagen, where his first physical researches dealt with electric currents and acoustics. During an evening lecture in April 1820, �rsted discovered that a magnetic needle aligns itself perpendicularly to a current-carrying wire, definite experimental evidence of the relationship between electricity and magnetism. This phenomenon had been first discovered by the Italian jurist Gian Domenico Romagnosi in 1802, but his announcement was ignored. �rsted's discovery (1820) of piperine, one of the pungent components of pepper, was an important contribution to chemistry, as was his preparation of metallic aluminum in 1825. In 1824 he founded a society devoted to the spread of scientific knowledge among the general public. Since 1908 this society has awarded an �rsted Medal for outstanding contributions by Danish physical scientists. In 1932 the name oersted was adopted for the physical unit of magnetic field strength. It is the cold-blooded murder of 96 Ohio Amerindians, mostly Delawares (= Lenapes), by an American Revolutionary War officer, Captain David Williamson, and his militia at Gnadenh�tten Village south of what is now New Philadelphia, Ohio. The Amerindians, who had been converted by Moravian Brethren and were peaceful Christians, were under suspicion because of their neutrality in the war. Williamson and his 90 volunteers, seeking revenge for Amerindian raids on frontier settlements, pretended friendship and disarmed the tribe; on the following morning they slaughtered the villagers in cold blood. Two scalped boys escaped to relate the incident. In 1782, the village of Gnadenhütten had about 100 Christian Amerindians, mostly Delawares, there to gather crops from their fields. Although the Amerindians professed and practiced neutrality, the British, Americans, and other Amerindians did not trust those living at Gnadenhütten. The leader of the mission, David Zeisberger, had been tried by the British for treason. He had been cleared of the charges in a British court While the Amerindians were harvesting the corn, some white settlers were attacked. Other settlers blamed those at Gnadenhütten for the violence. The settlers organized and went to Gnadenhütten where they claimed to find clothing from the murdered whites. The Amerindians were confined to their church while the settlers voted on their fate. Less than 20 of the approximately 100 whites voted against the murder of the Amerindians. When the Amerindians learned of their fate, they spent the night praying and signing hymns. In the morning, 09 March, the Amerindians are led from the church in pairs and their skulls are crushed with mallets. In all, 28 men, 29 women, and 39 children are murdered. 1748 Joseph Christophe (or Christophle), French artist born in 1662. 1719 Peeter van Bredael (or Breda), Flemish artist born on 29 July 1629. 1692 Willelm (or Guilliam) van Heusch, Dutch artist born in 1638. 1680 Dirck Dirckszoon Bontepaert Santvoort (or Zantvoort), Dutch artist born in 1610. 1963 El Museo Picasso se inaugura en Barcelona. 1949 Isabel Tocino Biscarolasaga, pol�tica espa�ola. 1948 Emma Bonino, pol�tica italiana, comisaria de la UE. 1934 Yuri Gagarin, Russian colonel, test pilot, first man in space (a 108-minute trip with a 89-minute orbit on 12 April 1961). He died on 27 March 1968 in the crash of the new aircraft he was test-flying..
1931 Le�n Febres Cordero, pol�tico ecuatoriano. ^ 1925 G. William Miller, 65th US Secretary of the Treasury. Born in Sapulpa, Oklahoma in 1925, Miller did a stint in the military before heading to practice corporate law in New York City. Miller�s run up the ladder of the private sector continued when he made vice president of Textron, Inc., in 1957. In 1960, Miller was named president of Textron and later in the decade became the company�s CEO. However, in 1974, Miller crossed over into the public sector and joined the Federal Reserve Board. Though he had risen to the top of the fed in 1978, Miller was not done job-hopping: in 1979, he accepted President Jimmy Carter�s nomination to become treasury secretary. Miller held the post until early 1981, when Republican challenger Ronald Reagan swept Carter from office. ^ 1913 The Voyage Out, Virginia Woolf's first novel, goes to publisher. Virginia Woolf, 31, delivers the manuscript of her first novel, The Voyage Out, to her publisher. Coincidentally, this date is also the 21st birthday of Woolf's future lover, Vita Sackville-West, whom Woolf would not meet until 1925. Woolf, born Adeline Virginia Stephen in London on 25 January 1882, grew up surrounded by intellectuals. Her father was a writer and philosopher, and her mother was a British aristocrat. In 1902, Virginia's father died, and she took a house with her sister and two brothers in the Bloomsbury district in London near the British Museum. The family developed close friendships with other intellectuals and writers, including writer E.M. Forster, economist J.M. Keyes, and biographer Lytton Strachey. Their group came to be known as the Bloomsbury Group, a leisured set known later for their intellectual and sexual nonconformism: Many of the group, including Woolf herself, were bisexual or homosexual. Woolf became a regular contributor to the Times Literary Supplement and also took odd jobs to support herself until she inherited a comfortable income from an aunt. Virginia married writer and social reformer Leonard Woolf in 1912. The couple established the Hogarth Press in their dining room several years later. In addition to Virginia Woolf's later novels, the press also published T.S. Eliot and translations of Chekhov and Dostoevsky. 1907 Mircea Eliade, historiador y etn�logo rumano. ^ 1900 Howard Hathaway Aiken, inventor of the Mark I computer. Howard Hathaway Aiken, born on 09 March 1900, a Harvard researcher, developed a large-scale digital calculator to solve nonlinear differential equations for his thesis work. Previously, complex calculations were performed by dozens of human calculators  usually women-paid to do math problems all day. Aiken, with the support of IBM, developed the first fully automatic calculating machine: The Mark I was 15.5-m-long and 60cm wide, and it was powered by a fifteem-meter-long mechanical shaft attached to a five-horsepower electric motor. The machine included more than half a million parts and hundreds of kilometers of wiring. It could store seventy numbers and perform three additions or subtractions per second, and it weighed five tons. Aiken's work was heavily influenced by the theories and proposals of English mathematician Charles Babbage [26 Dec 1791 – 18 Oct 1871] and the writings of Babbage's prot�g�, Ada Lovelace [10 Dec 1815 – 27 Nov 1852], daughter of the poet Byron [22 Jan 1788 – 19 Apr 1824]. Aiken died on 14 March 1973. 1890 (25 Feb Julian) Vyacheslav Mikhaylovich Skryabin “Molotov”, Soviet statesman and diplomat who was foreign minister and the major spokesman for the Soviet Union at Allied conferences during and immediately after World War II. A member and organizer of the Bolshevik party from 1906, Molotov was twice arrested (1909, 1915) for his revolutionary activities. After the Bolsheviks seized power (1917), Molotov worked in several provincial party organizations. In 1921 he became a member and a secretary of the Central Committee as well as a candidate member of the Politburo. He staunchly supported Joseph Stalin [21 Dec 1879 – 05 Mar 1953] after the death of Vladimir Ilich Lenin [22 Apr 1870 – 21 Jan 1924], and in December 1926 he was promoted to full membership in the Politburo. He then assumed control of the Moscow Party Committee and purged the Moscow organization of its anti-Stalin membership (1928�1930). In 1930 he was made chairman of the Council of People's Commissars (i.e., prime minister of the Soviet Union), a post he held until 1941. Having dismissed on 03 May 1939 the Soviet commissar of foreign affairs, the anti-Nazi Jew Maksim Maksimovich Litvinov [17 Jul 1876 – 31 Dec 1951], Stalin picked Molotov to replace him. In this capacity Molotov negotiated with the Nazi foreign minister, Joachim von Ribbentrop [30 Apr 1893 – 16 Oct 1946], the German-Soviet Nonaggression Pact (Molotov-Ribbentrop Pact; 23 August 1939). In May 1941, when Stalin himself took over as chairman of the Council of Ministers (formerly Council of People's Commissars), Molotov remained its first deputy chairman. After Germany invaded the Soviet Union (June 1941), he also served on the State Defense Committee (the special war cabinet). Molotov arranged the Soviet alliances with Great Britain and the United States and attended the Allies' conferences at Tehran (1943), Yalta (1945), and Potsdam (1945) as well as the San Francisco Conference (1945), which created the United Nations. (It was during World War II that Molotov ordered the production of the bottles of inflammable liquid that became known as Molotov cocktails.) In his wartime dealings with the Allies and afterward, he earned a reputation for uncompromising hostility tothe West. In March 1949 Molotov gave up the post of foreign minister, but, after Stalin died, he resumed it, holding it until his political disagreements with Nikita Sergeyevich Khrushchev [17 Apr 1894 – 11 Sep 1971] resulted in his dismissal (June 1956). He was made minister of state control in November, but, when he joined the �antiparty group� that unsuccessfully tried to depose Khrushchev in June 1957, he lost all his high party and state offices. He subsequently served as ambassador to Mongolia and as the Soviet delegate to the International Atomic Energy Agency in Vienna (1960�1961). In 1962, after engaging in more criticisms of Khrushchev, he was expelled from the Communist Party. He lived thereafter in undisturbed retirement in Moscow until his death on 08 November 1986. 1881 Ernest Bevin, British trade unionist and statesman, one of the mostpowerful British union leaders in the first half of the 20th century. He also proved to be a forceful ministerof labour and national service during World War II and foreign secretary in the immediate postwar period. He died on 14 April 1951. 1879 Otto Hahn, German chemist who, with the radiochemist Fritz Strassmann, is credited with the discovery of nuclear fission. He was awarded the Nobel Prize for Chemistry in 1944 and shared the Enrico Fermi Award in 1966 withStrassmann and Lise Meitner. Hahn died on 28 July 1968. 1874 John Duncan Fergusson, British artist who died on 30 January 1961. — more with links to images. 1871 S. Granville Redmond, US painter who died in 1935. — links to two images. 1873 Royal Canadian Mounted Police founded. 1856 Thomas William Roberts, British Australian painter who died in 1931.  MORE ON ROBERTS AT ART 4 MARCH with links to images. Oh mia patria si bella e perduta! O membranza s� cara e fatal! Perch� muta dal salice pendi? Che ne infonda al patire virt�! 1831 La Légion Etrangère se crea en Francia. ^ 1822 Artificial teeth, patented by Charles Graham of NY. Replacements for decayed or lost teeth have been produced for millennia. The Etruscans made skillfully designed false teeth out of ivory and bone, secured by gold bridgework, as early as 700 B.C. Unfortunately, this level of sophistication for false teeth was not regained until the 1800s. During medieval times, the practice of dentistry was largely confined to tooth extraction; replacement was seldom considered. Gaps between teeth were expected, even among the rich and powerful. Queen Elizabeth I (1533-1603) filled the holes in her mouth with cloth to improve her appearance in public. When false teeth were installed, they were hand-carved and tied in place with silk threads. If not enough natural teeth remained, anchoring false ones was difficult. People who wore full sets of dentures had to remove them when they wanted to eat. Upper and lower plates fit poorly and were held together with steel springs; disconcertingly, the set of teeth could spring suddenly out of the wearer's mouth. Even George Washington (1732-1799) suffered terribly from tooth loss and ill-fitting dentures. The major obstacles to progress were finding suitable materials for false teeth, making accurate measurements of patient's mouth, and getting the teeth to stay in place. These problems began to be solved during the 1700s. Since antiquity, the most common material for false teeth was animal bone or ivory, especially from elephants or hippopotami. Human teeth were also used, pulled from the dead or sold by poor people from their own mouths. These kinds of false teeth soon rotted, turning brown and rancid. Rich people preferred teeth of silver, gold, mother of pearl, or agate. In 1774 the French pharmacist Duchateau enlisted the help of the prominent dentist Dubois de Chemant to design hard-baked, rot-proof porcelain dentures. De Chemant patented his improved version of these "Mineral Paste Teeth" in 1789 and took them with him when he emigrated to England shortly afterward. The single porcelain tooth held in place by an imbedded platinum pin was invented in 1808 by the Italian dentist Giuseppangelo Fonzi. Inspired by his dislike of handling dead people's teeth, Claudius Ash of London, England, invented an improved porcelain tooth around 1837. Porcelain teeth came to the United States in 1817 via the French dentist A. A. Planteau. The famous artist Charles Peale (1741-1847) began baking mineral teeth in Philadelphia, Pennsylvania, in 1822. Commercial manufacture of porcelain teeth in the United States was begun, also in Philadelphia, around 1825 by Samuel Stockton. In 1844 Stockton's nephew founded the S.S. White Company, which greatly improved the design of artificial teeth and marketed them on a large scale. Fit and comfort, too, gradually improved. The German Philip Pfaff (1715-1767) introduced plaster of pairs impressions of the patient's mouth in 1756. Daniel Evans of Philadelphia also devised a method of accurate mouth measurement in 1836. The real breakthrough came with Charles Goodyear's discovery of vulcanized rubber in 1839. This cheap, easy-to-work material could be molded to fit the mouth and made a good base to hold false teeth. Well-mounted dentures could now be made cheaply. The timing was fortuitous. Horace Wells (1815-1848) had just introduced painless tooth extraction using nitrous oxide. The number of people having teeth removed skyrocketed, creating a great demand for good, affordable dentures, which Goodyear's invention made possible. After 1870, another cheap base, celluloid, was tried in place of rubber, but it too had drawbacks. Today dentures are either plastic or ceramic. ^ 1814 (25 February Julian) Taras Hryhorovych Shevchenko, Ukraine's national poet. Born in Morintsy, Ukraine, Russian Empire, Taras Shevchenko would become the foremost Ukrainian poet of the 19th century and a major figure of the Ukrainian national revival, as well as an accomplished painter. &n bsp; Born a serf, Shevchenko was freed in 1838 while a student at the St. Petersburg Academy of Art. His first collection of poems, entitled Kobzar (1840; "The Bard"), expressed the historicism and the folkloristic interests of the Ukrainian Romantics, but his poetry soon moved away from nostalgia for Cossack life to a more somber portrayal of Ukrainian history, particularly in the long poem "The Haidamaks" (1841). When the secret Brotherhood of Saints Cyril and Methodius was suppressed in 1847, Shevchenko was punished by exile and compulsory military service for writing the poems "The Dream," "The Caucasus," and "The Epistle," which satirized the oppression of Ukraine by Russia and prophesied a revolution. Though forbidden to write or paint, Shevchenko clandestinely wrote a few lyric poems during the first years of his exile. He had a revival of creativity after his release in 1857; his later poetry treats historical and moral issues, both Ukrainian and universal. Shevchenko died on 10 March (26 February Julian) 1861, in Saint-Petersburg, Russia. And all God's creatures go to rest. What kind of harvest there will be! O stupid children, Folly's sons! Embrace her mighty ruin here! True justice, strength, and liberty! Is punished by our God Himself. A home to give him peace of mind. Our ancestors: their toilsome deeds! The glory of our own Ukraine! And dry her tears without annoy. With lips that speak of liberty! I beg you in all eagerness! 1809 Johan Hendrik Louis Meyer, Dutch artist who died on 31 March 1866. 1791 First use of ether as anesthetic, by US surgeon George Hayward. 1749 Honor� Gabriel Riquetti, conde de Mirabeau, pol�tico franc�s. 1734 (baptism) Francisco Bayeu y Sub�as, Spanish painter who died on 04 August 1795.  MORE ON BAYEU AT ART 4 AUGUST with links to images. 1750 Johann-Friedrich-August Tischbein, German painter who died on 21 June 1812. — more with links to images. 1621 Egbert Lievensz van der Poel, Dutch painter who died on 19 July 1664.  MORE ON VAN DER POEL AT ART 4 JULY with links to images. 1454 Amerigo Vespucci, in Florence, Italy, merchant and explorer-navigator who took part in early voyages to the New World (1499�1500, 1501�1502) and occupied the influential post of piloto mayor in Seville from 1508 until his death in 1512. — Saint Gregory, bishop of Nyssa. — Saint Frances of Rome, patron of motorists, housewives. — Memphis, Tenn: 1st of the 5 days of the Cotton Carnival. 1) Inflatable dart board. 2) Glow-in-the-dark sunglasses. 3) A book on how to read. 4) Solar-powered flashlight.